Jet, Wal-Mart Stores, Inc. Vs Amazon.com, Inc.
Will Jet.com Save Wal-Mart Stores, Inc. (NYSE: WMT) from Amazon.com, Inc. (NASDAQ:AMZN) fury? What are you expecting for WMT? Get your estimate in here! Walmart is prepared to announce its fiscal second quarter earnings early tomorrow morning. The world’s largest retailer is coming into its report on a high note after agreeing to purchase Jet.com for $3.3 billion earlier this month. This marks the largest purchase to date of an e-commerce startup. Clearly the move is intended to help WMT catch up with online giant Amazon which continues to outpace the overall retail sector. That isn’t to say Walmart is doing poorly. The company is coming off a better than expected first quarter with expectations for another one tomorrow. Analysts at Estimize are calling for earnings per share of $1.04, 4% lower than the same period last year. 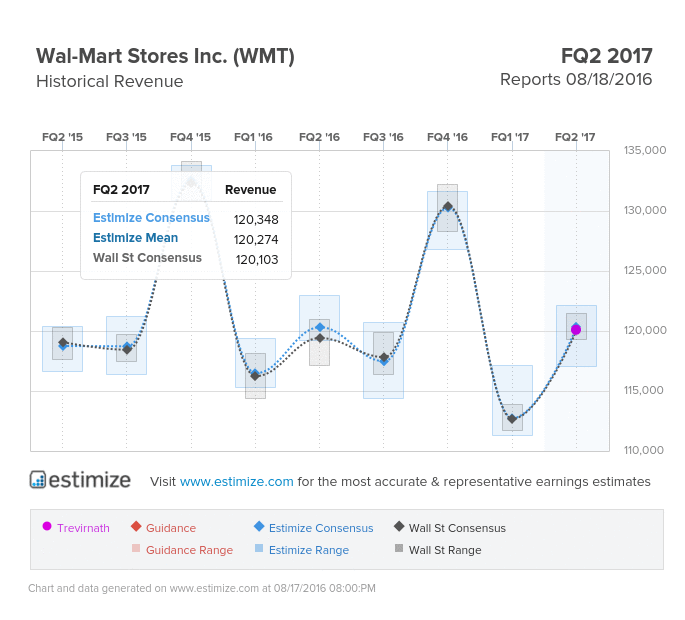 That estimate has increased 3% since Walmart’s most recent report in May. Revenue is anticipated to come in flat at $120.35 billion, consistent with the improving trends in the retail environment. Shares are up 18% year to date but historically have declined by 1% following a report. It has been no secret that Walmart is trailing Amazon as an ecommerce retailer. Its acquistiion of Jet.com is a direct message to Amazon that they are coming for them. Most experts don’t believe Jet’s platform will close the gap but moving Marc Lore to lead its e commerce efforts might help. Last quarter online sales rose a sluggish 7%, consistent with the slowdown over the last year. Along with boosting online sales the company is focused on creating a better customer experience and lowering prices even further. These initiatives might generate sales but it will also pressure margins. Walmart’s biggest advantage over Amazon and other online retailer is its expansive grocery and fresh food offerings. Walmart’s are often considered one stop shops for families to do their weekly grocery shopping and to pick up anything else they might need. The adoption of these services amongst online retailers have yet to gain traction. Amazon is of course testing this out as part of its Amazon Prime services. In the meantime, Walmart, Target and Costco will have the upperhand in this segment. 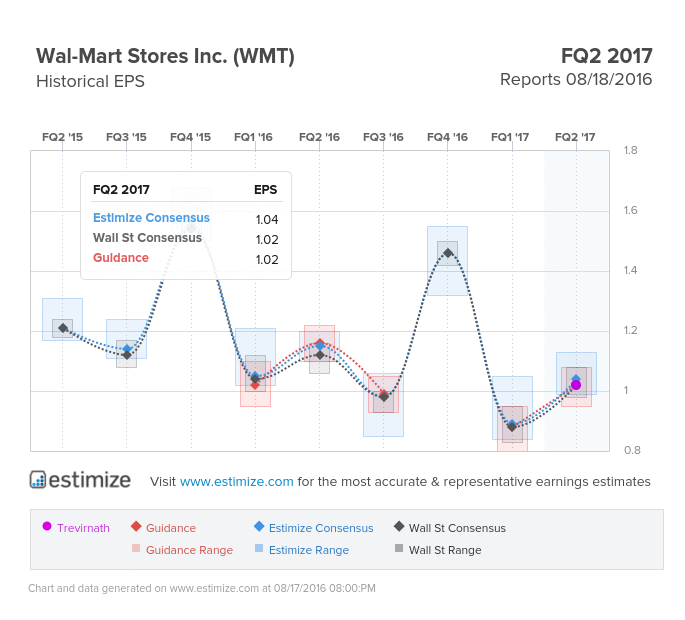 Do you think WMT can beat estimates? There is still time to get your estimate in here!